Café2Go® Self-Heating Beverage and Soup Kits combine our TRUETECH® Self-Heating Technology with tasty beverage and soup kits for military and civilian use. 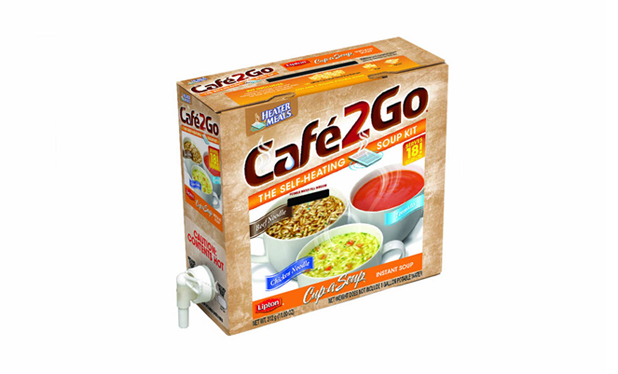 Café2Go® Kits pair our TRUETECH® Self-Heating Technology with tasty beverages and soups. Café2Go® is available to the U.S. Military, first responders, law enforcement, firefighters, outdoor enthusiasts, remote construction workers and anyone else who wants to enjoy a hot beverage or Cup-a-Soup® on-the-go. 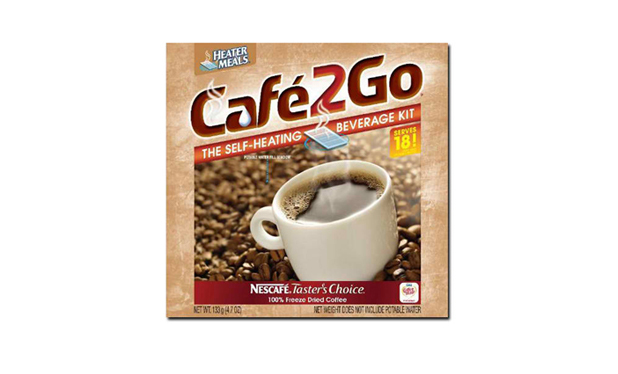 In just 30 minutes Café2Go® Kits heat 18 cups of water, so you can enjoy your favorite NESCAFÉ®, NESTEA®, NESTLÉ® and Cup-a-Soup® products. 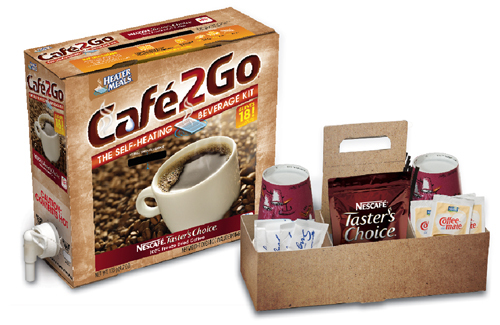 Café2Go® Self-Heating Coffee Kits include a NESCAFÉ® Taster’s Choice® 100% freeze-dried coffee pouch, 18 Coffee-mate® creamers, 18 sugar packets, 18 cups and 18 stirrers. You supply one gallon of potable water and we supply the heat! 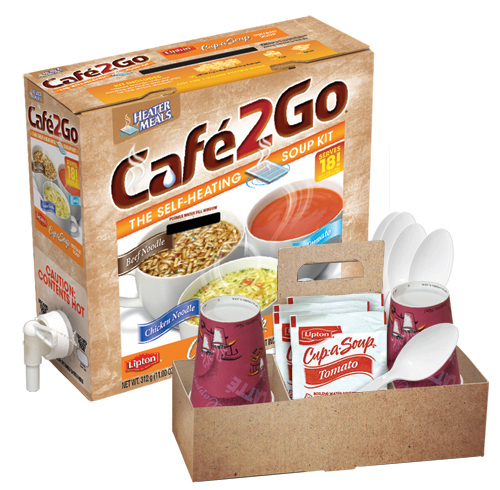 Café2Go® Self-Heating Soup Kits include six of each of your favorite Lipton® Cup-a-Soup® flavors: Chicken Noodle, Beef Noodle and Tomato, as well as 18 cups and 18 spoons. You supply one gallon of potable water and we supply the heat! 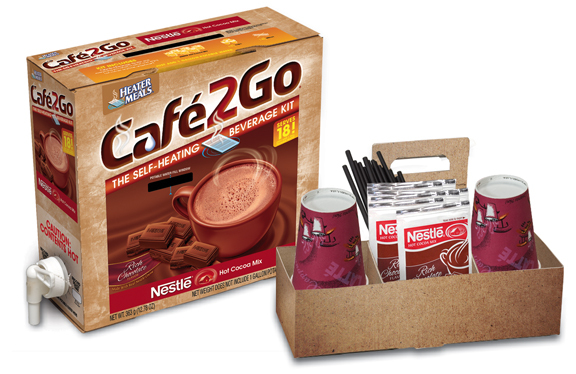 Café2Go® Self-Heating Hot Cocoa Beverage Kits include 18 packets of NESTLÉ® Hot Cocoa Mix, 18 cups and 18 stirrers. You supply one gallon of potable water and we supply the heat! 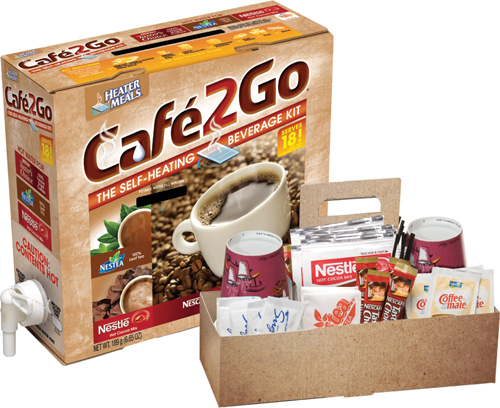 Café2Go® Self-Heating Variety Beverage Kits include 12 pouches of NESCAFÉ® Taster’s Choice® freeze-dried coffee, 3 NESTEA® Leaf Tea Bags, 3 NESTLÉ®Hot Cocoa Mix, 18 Coffee-mate® creamers, 18 sugar packets, 18 cups and 18 stirrers. You supply one gallon of potable water and we supply the heat! Café2Go® Self-Heating Beverage Kits come with premium brand name coffee, tea and cocoa products from NESCAFÉ®, NESTEA® and NESTLÉ®. You supply one gallon of potable water and we supply the heat! Beverage kits also include cups, stirrers, sugars and creamers. Café2Go® Self-Heating Soup Kit includes six packets of each of your favorite Lipton® Cup-a-Soup® flavors: Chicken Noodle, Beef Noodle and Tomato, as well as cups and spoons. As with our beverage kits, you supply one gallon of potable water and we supply the heat!